Another weekend, another round of interesting races around the world. And this week’s clear theme is the word under, with the SUPs Downunder race in Australia and the underground BAT Race in Switzerland set to dominate the news cycle. First up will be the “Downunder” race in Oz, which has morphed into a Gorge-style double downwinder after stormy seas shut down the original course. While this is the inaugural edition of the race, the simple fact it’s held on Queensland’s Gold Coast – home of last week’s epic 12 Towers and a paddling mecca in general – means it should be a pretty solid showing. Plenty of the internationals from last Saturday are still in town including the New Cal crew led by Titouan Puyo, Noic Garioud and Clement Colmas (who’ll be licking their lips at the prospect of some real bumps), Bernd Roediger from Maui, Itzel Delgado from Peru, plus of course the top Aussies such as Lincoln Dews, Jimmy Casey, Jake Jensen, Angie Jackson and Terrene Black. So expect a solid battle at the pointy end of the field. Originally planned as a beach race, strong wind and messy ocean conditions have forced organisers to get creative and do a lagoon-side double downwinder instead. The first round is for everyone to enjoy, before the top 30 get a second run to have a shot at the $12k prize purse. Some not-so-bold predictions: Titou, Lincoln and Noic on the men’s podium (throw Bernd Roediger in the mix if it’s really windy), with Angie, Terrene and last week’s runner-up Kate Baker likely to dominate the women’s. We’ll have results on Saturday afternoon (or as soon as I actually reach the finish line myself). While the Gold Coast will have the big names, the big star of this weekend is surely the underground BAT Race. And when I say the BAT Race is “underground,” I don’t mean it’s something only those cool kids at school with the tight jeans know about, I mean it’s *literally* under ground. 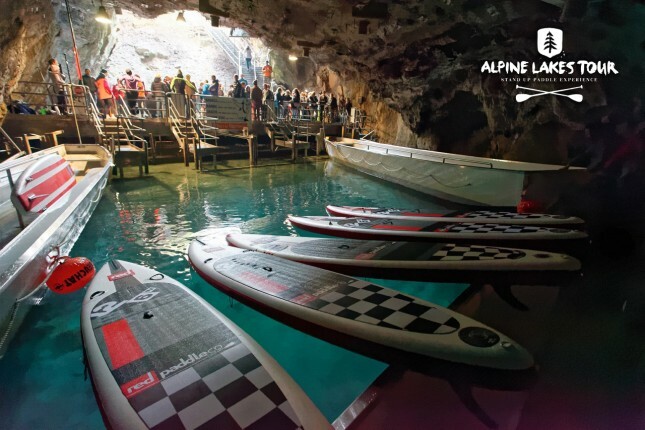 Arguably the world’s most unusual SUP event, the BAT Race takes place on an underground lake in Switzerland. One of the early-season stops on the fantastic Alpine Lakes Tour (which counts the GlaGla Race as its headline act), this event is part-athletic competition, part-pure novelty event. And we love it. 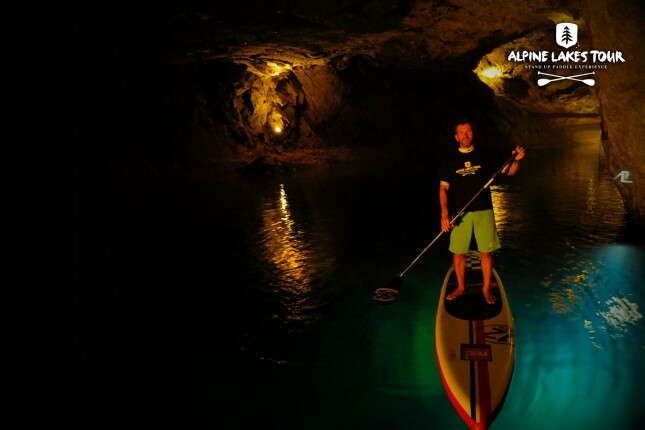 The BAT Race sends paddlers charging down a 300 metre long, 20 metre wide chasm somewhere in the Swiss mountains for what is surely the most surreal experience you can have on a stand up paddle board. 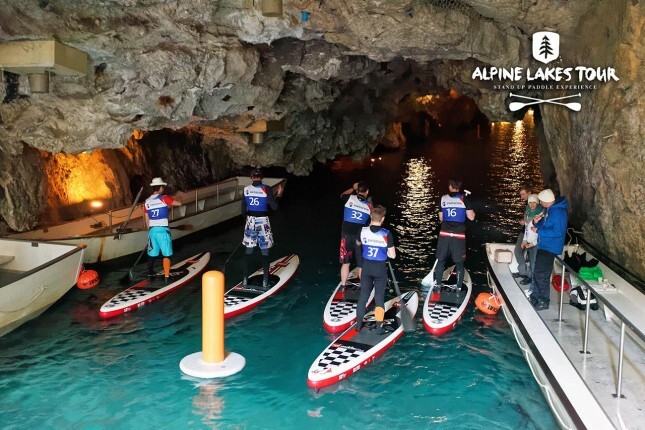 Despite being held on Europe’s largest underground lake (Saint Léonard), the course looks very tight with little room for error around the buoys. That’s if you’re even lucky enough to get a spot: due to some very obvious logistical constraints, the BAT Race is limited to just a few dozen paddlers. Using a flotilla of Red Paddle Co boards and with the aid of some serious floodlights, the race also produces some pretty amazing imagery, so check back on Sunday for photos and videos of the underground showdown. Also follow the Alpine Lakes Tour on Facebook for more updates.